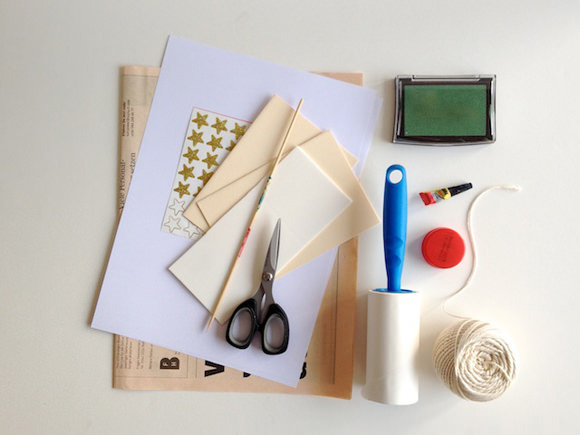 Look­ing for an easy way to print cards and wrap­ping paper with your chil­dren? 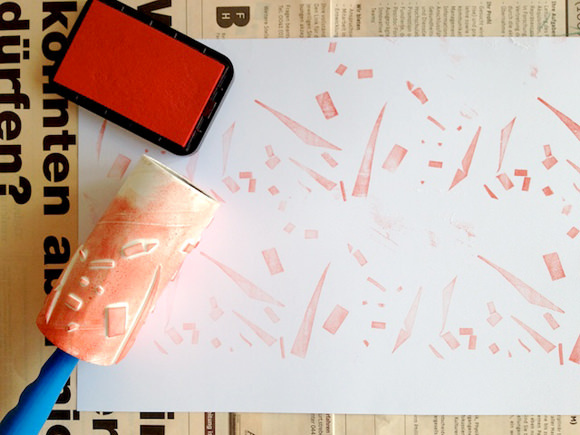 This roller print­ing tuto­r­ial shows you how to craft fes­tive Christ­mas tree stamps using a lint roller and how to trans­form a bot­tle cap into a stamp for envelopes. Cut the craft foam in 8 pieces approx­i­mately 1 x 2.5 inches each. Cut tree shapes out of them. Take the skewer stick and make some tiny holes in the trees. Cut a piece of baker’s twine. Add the foam to the roller: Posi­tion the trees so that their stumps point to the han­dle. Wrap the twine around and through the trees so that it looks like a hill­side or a walk. Press the roller onto an ink pad and roll until it is com­pletely cov­ered with green ink. Step 4Roll it onto your paper. Let the ink dry. Add some star stick­ers if you like. Press the stamp onto an ink pad and trans­fer to your envelopes. While clean­ing up, I dis­cov­ered that I could even use the scrap foam to make a confetti-like pattern. Have fun with this easy hol­i­day craft!